This was my exactly my fourth run in the month of May. Count ‘em – four. When I took myself out of the Superhero Half Marathon because of an injury, my thoughts immediately turned to the problem of my streak. The half was on May 18th, and because of the injury that weekend was out. But that only left two other weekends to get a race in – one of those was Memorial Day weekend, and the other had to have a race on Saturday because Sunday is the 1st of June. I began to believe that the streak was going to come to an end. I sat on that thought for a few days. And then my stubbornness rose up, screaming, and basically asked me what the hell I was doing. 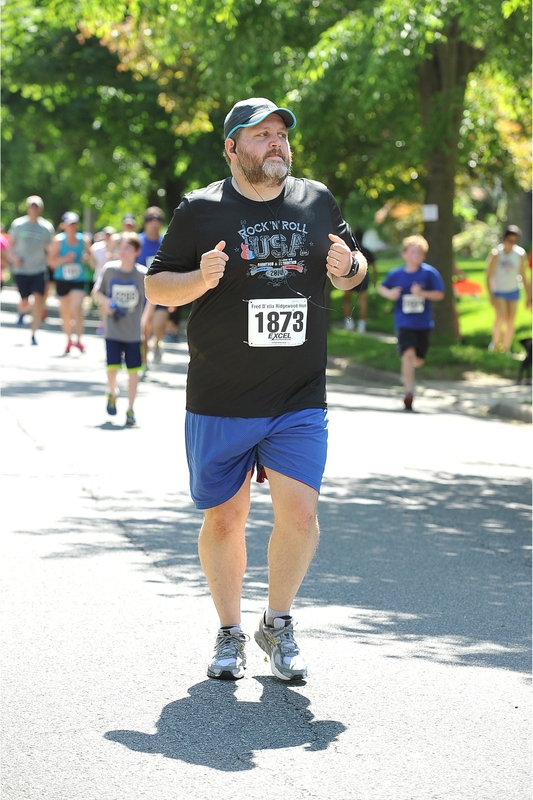 After 14 months of streaking … and with the next 5 months already booked up and registered for … and with the foot / ankle feeling much, much better … what the hell are you doing? So I found this race and registered. I had very few expectations – I only knew it was about 30 minutes from the house and this would be the 39th year, so there would be some organization. 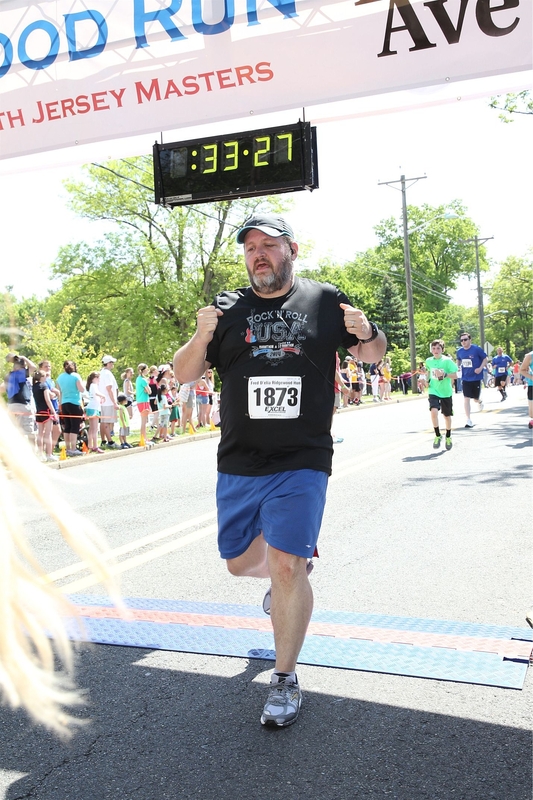 The Ridgewood Run (I have no idea who Fred D’elia is) has been run by the New Jersey Masters running club on Memorial Day weekend for longer than I’ve been alive. The day consists of multiple separate races – a 10K wheelchair event, a regular 10K, the 5K, an elite mile, a masters mile, and a one mile “fun run”. There is prize money, and the mile requires a qualifying time for entry. Interestingly, they run the races non-concurrently – the 10K goes first, and then the 5K doesn’t start until that one is completely done, then the mile, then the fun run. That meant that my race wasn’t scheduled to start until 10:15am – which means the wife and child could come. We got a perfect day, if a little hot. We got there around 9:15, and by that time people were already crossing the finish line from the 10K. Because of the number of people running (nearly 1,000 for the 10K, over 1,700 for the 5K), there actually was a little expo of sorts, with different local businesses set up at tables. They had a DJ / MC presiding over things at the finish line, which is always nice. And overall this felt like a real event. I had no intention to go try and PR – I knew better. But I didn’t just want to go walk it, either. So I took a couple of warmup laps around a nearby baseball field and then went and lined up. There were no pacing signs or corrals, so the start line was a total free-for-all, and it felt that way for the first half mile. But eventually things lined out and got comfortable. The course itself was through a very nice residential neighborhood, and there was quite a lot of support. There were probably four water stops (in a 5K!) and lots of people sitting out in their yards. Many people had a water hose spraying the street, and in at least one place somebody had attached a sprinkler to a ladder so they didn’t have to stand there with the hose. Predictably, I started way too fast. 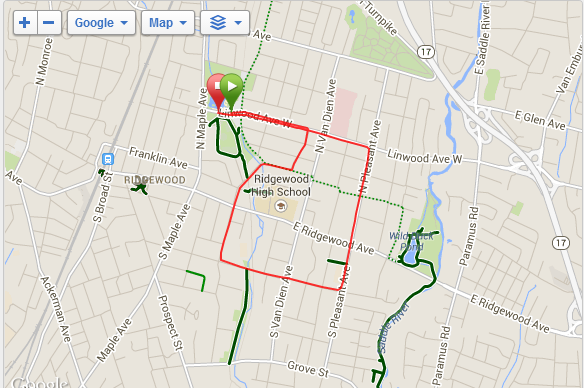 My first mile came in at 9.46, which was a PR pace and totally unsustainable. I felt OK, but as an academic exercise I knew that I was going to pay for that. Not far into the second mile there was a little hill that forced me to slow down, and I maintained a more reasonable (for this race, anyway) 11.02 pace for the second mile. The third mile brought a walk break over a decent sized hill, which slowed me down to 11.18 for that one – and then a downhill finish at 10:21 for the last .1 mile. The clock said 33.27 when I crossed the finish line, and my chip time came in at 32.59, for a 10.39 pace, or about 2 ½ minutes off of my PR. Can’t figure out how to stop holding my arms tight like that. – Prize money brings fast runners – the guy that won the 5K did it at 4.40 pace, and the winner of the mile did it at 4.02 pace. Seriously blazing. – Lots of confusion in the first mile, at water stops, and past the finish line. People were weaving and darting unexpectedly, and twice I nearly ran over someone who just dead stopped in front of me. Much of this was kids – there were several kids in the 8-12 age range. I don’t get at frustrated with all of this as I used to, but it would be good if folks were a touch more considerate. – Speaking of kids – I’ve noticed a pattern whenever I run races with kids. They do not appear to be able to hold a pace. They run really fast, and then stop and walk, rinse, repeat. It can be disconcerting near the end of a race like this to get blown by, but then in less than half a mile you wind up going back by the walker. – These things are fun when they feel like big events like this. In particular, having a DJ / MC is great – the announcements are clear and timely and there is just no question what is going on. Another cool thing is that they had a “History” tent, with pictures and t-shirts from many of the past runnings of this race. That definitely lends credibility to the proceedings. – The wife and boy were set up about a quarter mile from the end of the race. Having a cheering section is great … and some random dude standing next to them was yelling my name, too. Awesome. – No real swag – I think the intent was that you get stuff at the tents. The shirt was a nice blue technical shirt, and the bib was unique to this race – which you know I think makes a big difference. – Next race: Branford Road Race 5M, Branford, Connecticut, June 15th. Nice job! Hope it was a pain-free run! Foot pain is completely gone! But knee pain comes and goes. Some runs are awesome, others are a struggle. But feeling good overall.